NEON, the well known tube specialist, is integrating the high end tube system in the Hi-Fi system MTB980D. Enjoy your pure and natural tube sound from many different sources. The NEON MTB980D is the strong powerful Micro Hi-Fi system. The combination of design, connectivity and sound is developed to for the NEON MTB series. The MTB980D has a stronger valves amp. The extra ordinary aluminium housing of the electronics is supporting the VFD display in the middle. All necessary functions can be addressed and viewed. Through the display you can see the tube amp doing its obligation. The remote control of the MTB980D is coming as well with a perfect aligned aluminium housing. The connectivity is outstanding for the price range. The standard connection would be AUX IN, CD, radio (DAB+ /FM) und the USB port (load by 5V any device or play music from a USB stick). But the highlight is the Bluetooth 4.0 (NFC) connection. The tube sound is soft and warm. But NEON, as the specialist for tubes, managed to bring the natural sound to great power of 2x 75W (RMS). The harmony of electronics and speaker boxes gives the entire system a perfect sound characteristic. The MTB980D Micro HiFi System is coming with a remote control, a power supply and speaker cables. 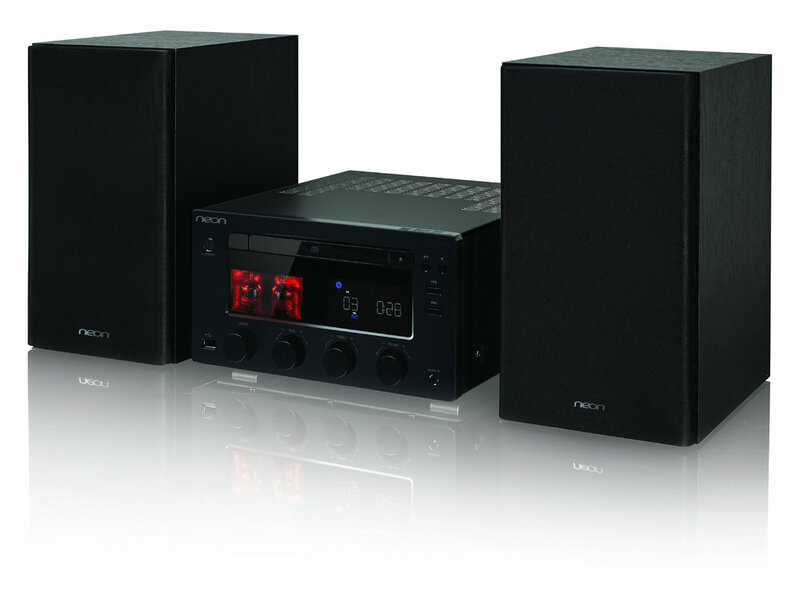 system: tube amplifier, 2-Kanal (Stereo) Micro Hi-Fi System with Bluetooth 4.0 (NFC), CD, DAB+, FM, AUX IN, USB.